Given the emphasis on monsters in this ad, perhaps a Halloween launch would have been more appropriate? Source: the <i>Toronto Star</i>, February 6, 1970. Burger Chef's first attempt to enter the Toronto market - the location is now a gas station. Source: the <i>Don Mills Mirror</i>, May 29, 1963. Source: the <i>Toronto Star</i>, February 12, 1970. Source: the <i>Toronto Star</i>, June 4, 1970. As the 1960s drew to a close, Canada was ripe for an American fast food invasion. Even if demand for cheap burgers and fries had temporarily peaked, the Great White North offered plenty of territory for chains like McDonald’s and Burger King to expand. 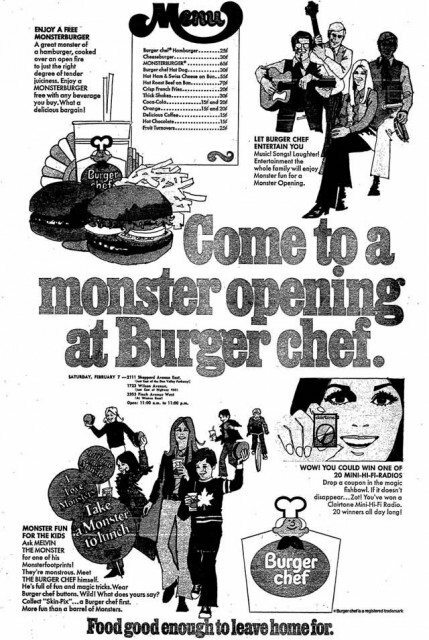 Among the invaders was Burger Chef, which seemed to have two ingredients of success: plenty of locations (over 1,000, putting it in second place behind the Golden Arches), and strong corporate backing from General Foods. Company officials made no pretense that Burger Chef was going to revolutionize the local fast food landscape. “We’re not going to reinvent the wheel,” vice-president C.C. Skinner told the Globe and Mail in 1970. “If there is something that other people can help us with, we will use it.” One possible source of help was the homegrown Harvey’s chain, which had considered the possibility of being taken over by General Foods earlier that year. After General Foods decided Harvey’s hamburgers were not a beautiful thing, Harvey’s management accused the food giant of dealing in bad faith and promptly cancelled a contract to buy General Foods–supplied coffee. After an initial advertising blitz in 1970 (which offered dubiously-named giveaways like “Skin-Pix”), Burger Chef adopted a lower profile. After a large loss, expansion halted the following year. McDonald’s Canada president George Cohon admitted his chain had crippled Burger Chef’s sales. By the end of the 1970s, remaining Canadian Burger Chef locations were being converted into Crock ‘N Block restaurants. Stateside, the chain didn’t last much longer: after its purchase by Canadian tobacco giant Imasco in 1982, most remaining locations were converted into Hardee’s outlets. Additional material from the February 26, 1969 and August 6, 1970 editions of the Globe and Mail, and the October 16, 1970 and May 24, 1979 editions of the Toronto Star.